I like new ideas. Since this is the case, I have to be careful. I have to be careful not to become enamored with an idea because of it’s novelty rather than its truth. For this reason, I have been very cautious about Brian McLaren’s ideas in A New Kind of Christianity. Even more than new ideas, though, I like ideas that answer questions or make sense of things that have confused me. For this reason, I find A New Kind of Christianity to be incredibly captivating. McLaren begins this book by charting the development of Christianity away from its Eastern and Jewish roots into what he calls a “Greco-Roman” religion. He then identifies the way most evangelical Christians understand the Bible as a “constitution” rather than seeing it as a divinely inspired “library.” Throughout the book McLaren uses these two ideas as the foundation for most of his thoughts about how Christianity needs to change. He shows how a Greco-Roman understanding of God and a constitutional reading of the Bible have had a negative effect on Christianity. 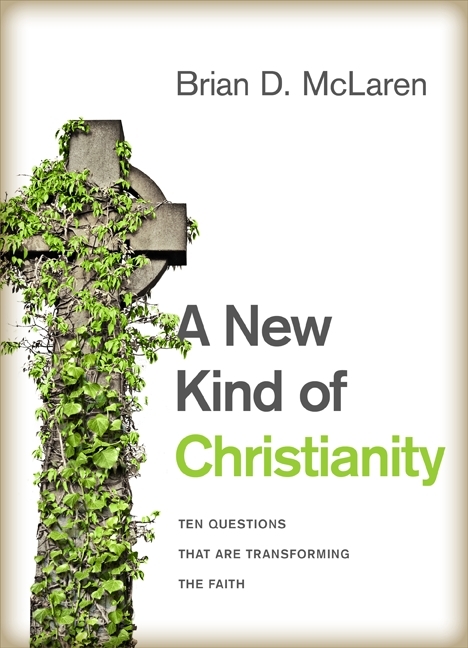 A New Kind of Christianity addresses ten specific questions that are central to current discussions of religion in our world. “Is God Violent?” “What is the Gospel?” “Why is Jesus Important?” “What About Other Religions?” and “What About Homosexuality?” are some of the questions that are posed. I was very excited to read McLaren’s response to many of these questions as they have troubled me, and the responses that are often recited are simply not satisfying. I found some of McLaren’s ideas to be enlightening, and some to still not fully satisfy my wondering. Brian McLaren has been a lightening rod for criticism by evangelical Christians. This is not because his thoughts are completely original, but because he has taken ideas that have only existed in more liberal religious and academic circles and brought them to mainstream, conservative Christians. McLaren’s socially progressive politics have also drawn attack from many religious leaders. A New Kind of Christianity consolidates much of McLaren’s controversial theology. For example, McLaren rejects penal substitutionary atonement as the primary reason for Jesus death. He identifies the central idea of the gospel to be the Kingdom of God rather than the forgiveness of sin. Also, McLaren’s view of the Bible is far from what most would consider literalist. While many authors have to stretch to to make unconventional ideas understandable, Brian McLaren effortlessly make a powerful case for his ideas that seems both sensible and Scripturally sound. I am not convinced of all the ideas in A New Kind of Christianity, but I still think it is an incredibly important book. I believe that all Christians need to wrestle with the thoughts presented here. We must challenge our traditional ideas if we want to have a healthy faith. My primary problem with McLaren is that he seems to take pride in the controversy he creates. He sometimes presents himself as a lone voice of progressive reason speaking out in the wilderness of medieval tradition. Relating to your post on “doubt,” I believe Christians today are too confident that their specific set of beliefs is the correct one. We need to learn from the many mistakes in church history. We should continually recalculate to make sure we are on the right track. People who challenge current beliefs and practices are essential to keeping the Church healthy. We must lose our fear of them and thoughtfully enter the discussion.